On June 1st 2018, we celebrated a very special occasion for The Chimes School! Seven graduates were honored for their accomplishments within the Chimes School by receiving a Certificate of Program Completion. Before the graduates received their certificate, William Davis, part of The Chimes School graduating class, addressed the student body with his words of wisdom. 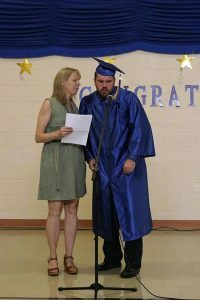 William is now working toward future goals with Chimes Vocational Services. The seven graduates traveled from Baltimore City, Baltimore County, Harford, Howard and Charles Counties. Following being presented with their certificates, the students were presented with congratulations from other classes. Then, a rendition of “Lean On Me” and The Chimes school song was sung by the choir. Awards were presented to Isaiah Thurston for Student of the Year, Jayden Torbit as Most Improved Student, and Brandon Braswell for Vocational Achievement. The Chimes Family is so proud of our graduates! Our school offers an 11 month educational program to students ages 5 to 21, that infuses functionality into everyday academics and work related skills, as well with priority on special skills development. The program includes both diploma (K-3) and certificate (K-12) tracks. It is our belief, that any student can learn and grow to his or her fullest potential. Click here to learn more.